Looking for effective przedtreningówki should reach precisely this product, which erected only active substances - no fillers. Pump, focus and bursting energy workout - this is what you will experience by choosing this supplement. You do not have enough time, newer and newer products that really do not represent a virtually nothing? 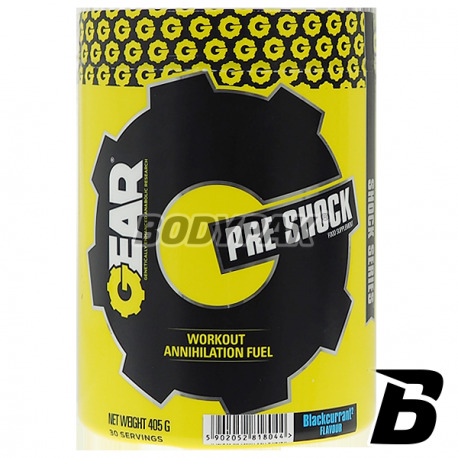 If so strong, set on Gear Pre Shock, which works not only on the label. I have not been on the market so well thought composition, the operation of which outshines the competition at every turn. High quality and efficiency are synonymous Pre Shock. Apply today this product and you'll find that all the previous pre-workout supplements with which you had contact - are simply weak. An additional advantage of this product are additives, so that the body is better able to take advantage of it supplied nutrients. 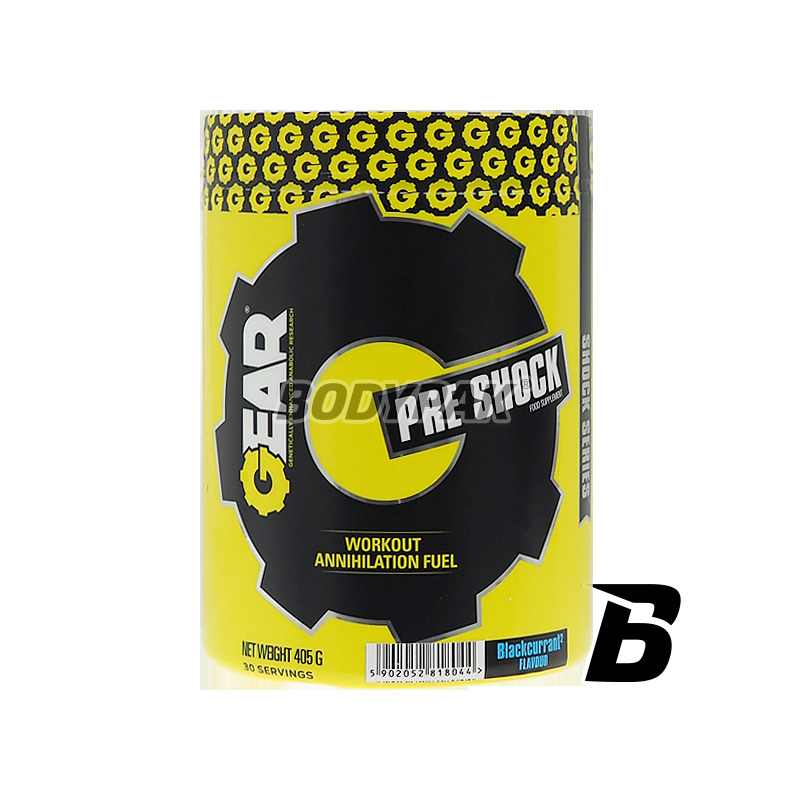 Pre Shock is a new pre-workout supplement designed for maximum optimization and the use of nutrients in the body during exercise. Very important for the body of vitamin C, B6 and B12, and minerals in bioavailable form of the best citrates of potassium, sodium, magnesium. Magnesium and Vitamin B6 contributes to the reduction of tiredness and fatigue. Magnesium also helps maintain electrolyte balance and potassium helps in the proper functioning of muscles and nervous system. Vitamin C and Vitamin B12 helps in the proper functioning of the immune system, contribute to the reduction of tiredness and fatigue. It helps in protecting cells against oxidative stress and helps in proper production of collagen in order to ensure the proper functioning of blood vessels, bones, gums, teeth and skin. Vitamins B6 and B12 helps to maintain normal energy metabolism, and vitamin B6 helps to maintain proper metabolism of proteins and glycogen. -Stimulating substances stimulants, or glucuronolactone and caffeine and taurine at optimal doses, which allow maintaining high mental and physical ability during long training sessions. Składniki: Beta–alanina (CarnoSyn®), alfaketoglutaran L-argininy (A-AKG), witaminy i minerały (cytrynian potasu, cytrynian magnezu, cytrynian sodu, witamina C (kwas L-askorbinowy), witamina B6 (chlorowodorek pirydoksyny), witamina B12 (cyjanokobalamina)), jabłczan cytruliny, tauryna, aromaty, regulator kwasowości (kwas cytrynowy), kofeina bezwodna, glukuronolakton, barwnik oraz aromat zależny od smaku, substancja słodząca (acesulfam K, sukraloza), substancja przeciwzbrylająca (dwutlenek krzemu). Ogólnie bardzo fajny preparat przedtreningowy. Na mnie super działa! Comprehensive preparation designed for Active Women to use during training! Each serving delivers BCAA (4: 1: 1) amino acids, vitamins, minerals, l-glutamine and a solid dose of l-carnitine. No sugar, lactose and carbohydrates!